Simon & Schuster, 9781476792033, 352pp. 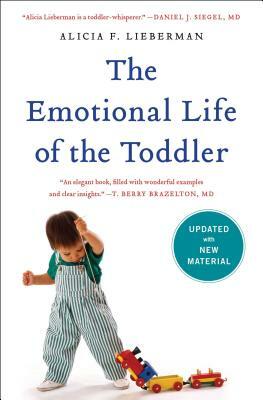 Now updated with new material throughout, Alicia F. Lieberman’s The Emotional Life of the Toddler is the seminal, detailed look into the varied and intense emotional life of children aged one to three. Hailed as “groundbreaking” by The Boston Globe after its initial publication, the new edition includes the latest research on this crucial stage of development. Anyone who has followed an active toddler around for a day knows that a child of this age is a whirlwind of explosive, contradictory, and ever-changing emotions. Alicia F. Lieberman offers an in-depth examination of toddlers’ emotional development, and illuminates how to optimize this crucial stage so that toddlers can develop into emotionally healthy children and adults. Drawing on her lifelong research, Dr. Lieberman addresses commonly asked questions and issues. Why, for example, is “no” often the favorite response of the toddler? How should parents deal with the anger they might feel when their toddler is being aggressively stubborn? Why does a crying toddler run to his mother for a hug only to push himself vigorously away as soon as she begins to embrace him? This updated edition also addresses twenty-first century concerns such as how to handle screen time on devices and parenting in a post-internet world. With the help of numerous examples and vivid cases, Lieberman answers these and other questions, providing, in the process, a rich, insightful profile of the roller coaster emotional world of the toddler. Alicia F. Lieberman, PhD, is the Irving B. Harris Endowed Chair in Infant Mental Health and professor in the department of psychiatry at the University of California San Francisco. The author of The Emotional Life of the Toddler, Psychotherapy with Infants and Young Children: Repairing the Effects of Stress and Trauma on Early Attachment, Don’t Hit My Mommy: A Manual for Child-Parent Psychotherapy with Young Children Exposed to Violence and Other Trauma, and numerous other publications, she is world-renowned for her work on parent-child attachment. She is the recipient of the 2017 Whole Child Award from the Simms/Mann Institute, 2016 Rene Spitz Lifetime Achievement Award from the World Association of Infant Mental Health, and other honors.